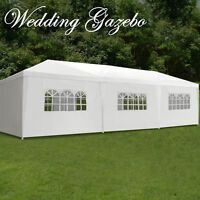 The FDW PT-1030-8-White is an elegant gazebo canopy-style wedding party tent with a capacity of 50 people. 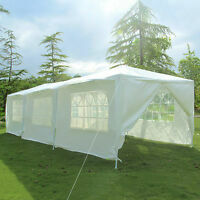 This white tent has a water-resistant polyethylene cover making it convenient to en_USe in all weathers. 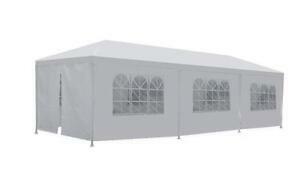 Additionally, it has a powder coated steel framework that makes the tent heat and ren_USt resistant. AAAAA+++++ GREAT COMMUNICATION>>> PERFECT CONDITION!!! THE TENT IS ABSOLUTLEY CRAP. ENDED UP NOT USING IT DUE TO POOR QUALITY..
Had a backyard party and put two of these together to make a 20x30 tent. Pretty easy to put together, some tubes were a little tight to fit into each other. Instructions were simple and to the point. No frills. I can see how in a windy environment that these could get banged up but overall they fit the bill. I would buy these again. Its hard to get them back into the original box but we did if. Grab to bungee cords to keep the lid down. Plan on a plastic container for long term storage. This is a very affordable tent. The material is lightweight and cheap. Unfortunately when we put it up and seems ripped and a velcro piece also ripped. We were very gentle and followed the directions. Would not purchase if you need it more than once or if there is a slight bit of wind expected. On the plus side it is a great size and looks nice. Since I cant post my actual review, as it has complaints about the seller as well as the product I will put it this way... I have seen many negative reviews on this same product. I should have listened. The package, recieved from Factory Direct Wholesale, was missing key supports right out of the box. I built my own supports, stronger than they would have been from the factory, and secured the tent to the ground. A short while later (like 4 hours) we had a wind gust of about 20mph. This broke 6 of the thin plastic connectors, 4 poles and ripped part of the top. The strongest part of the tent was the part that I BUILT... If you plan on using this for more than an indoor tent... avoid it like the plague. This is not a quality product by ANY standard. The covering material is very lightweight. It is about the weight of Tyvek house wrap. Be aware that there are lots of parts involved in assembling the frame and it will take some time to put up. Overall, considering the price it's a good value for an occasional use. It is not something that I would trust in stormy weather but I have not experienced it in stormy weather so perhaps another reviewer can comment. What more could i expect, This item for $99 is great. UPDATE: AFTER ONE EVENT ONE OF THE CENTER POLES BENT DURING ASSEMBLY. WE USED DUCK TAPE TO TAPE THE TWO POLES TOGETHER WHICH HELD UP NICELY. BUT HERES WERE THINGS WERE BAD!!!! THE ROOF SLOPE ON ALL SIDES ARE NOT STEEP ENOUGH TO MAKE WATER RUN OFF PROPERLY. WATER RUNS DOWN TILL IT GETS TO THE SIDE POLES ALONG THE EDGE AND THEN SITS THERE BUILDING UP. WE HAD A LIGHT DRIZZLE AND WE TRIED TO TIGHTEN THE ROOF MATERIAL TO HELP WITH IT NOT GETTINGS STUCK BUT THEN THE STITCHING WOULD COME UNDONE FROM THE STRAPS CONNECTED TO THE ROOF. MY POINT!!! I RECOMMENDING TAKING $99 AND PUTTING TO TOWARD ANOTHER SETUP., THIS WENT TO THE SCRAP YARD AFTER ITS FIRST EVENT AND IT NEVER GOT USED, WE ABANDONED IT AND WENT UNDER A PERMANENT SHELTER WITH OUR ELECTRONICS I just went through the materials today. Everything was there. And to my surprise the poles were pretty good quality. The Material was about what i expected, of which i have not looked at the roofing but it seems to be alittle on the thin side. But Hey $99 what can you expect. The Connectors go for that. And to be honest Ill be using this for outdoor events and even though the legs were more quality then what i expected im still replacing them with some super heavy duty antenna mask poles that i had laying around. And it was perfect diamater. Add a few budgets, some stones and another pole for inside the buckets and ill be ready for yard saleng from one day to another with out any tearing down of tables. Thanks Pros: Extremely great value Pretty good quality poles FAST SHIPPING ACCURATE QUANTITY COUNT Very easy to read directions 6 month warranty on defects of craftsmanship CONS: MATERIAL of windows and doors i wish was a wee bit thicker shipping box was coming apart on arrival one pole did have one dent in it, cant remember the number (Ill have it replaced in march-april thru warranty if i feel it alters the structure) Conclusion: For a few minor events like cooks outs, yard sales, maybe a campground where wind wont be a issue I would say this is a STEAL. I only upgraded the legs because the wind can get up sometimes around here, which is why i wanted to safe then sorry. Even though im not planning on leaving it out or anything.